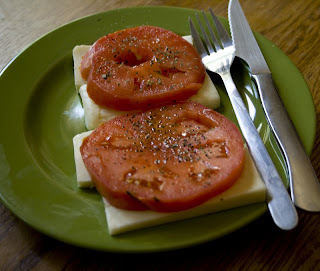 One of my favorite mid-afternoon summer snacks is a fresh tomato sliced with mozzarella and a pinch of salt and pepper, fresh basil (if you have it, all I had was dry today) and a little olive oil. It's so refreshing. It also makes a great appetizer for a dinner party.